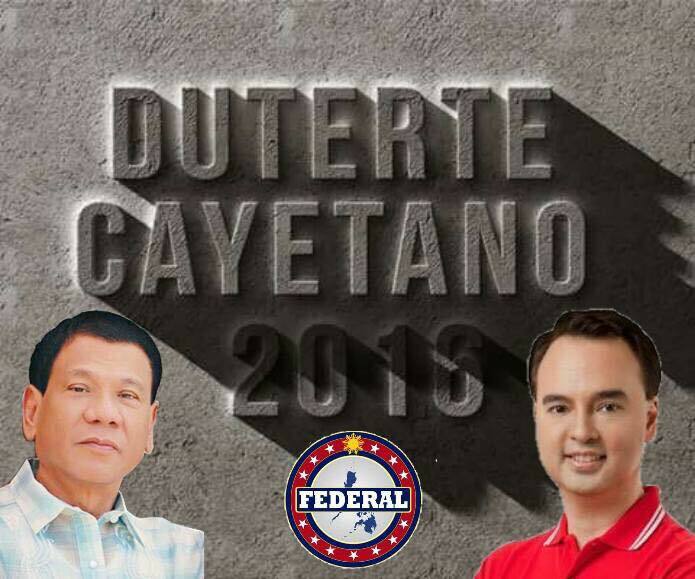 Let's take a break for a while..
Davao City is one of the Highly Urbanized City (HUC) in Asia and in the Philippines. This is really cool folks!! 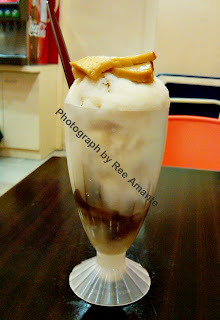 Finally, One of the finest taste of Halo-halo in the country is opening their branch here in Davao City. And it is located at the 4th floor of G.Mall (Gaisano Mall of Davao) and the other one is in Damosa Business Park, Lanang, DC. The original Razon's invade Mindanao island on the third quarter of 2010 (that was last year). 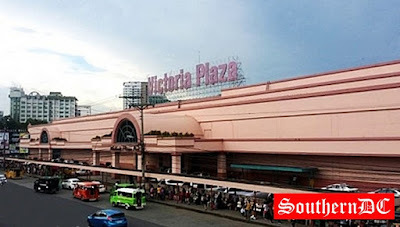 The company opened their first branch on September 2010 in General Santos City at the 2nd floor of KCC Mall. 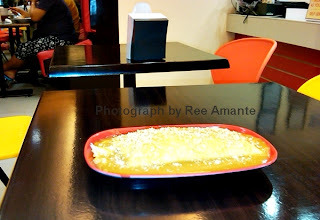 And after the success of Razon's in Tuna Capital of the Philippines, the company open another branch here in Davao City last July 2011 (this year), and it was their second branch in Mindanao area. Razon's version of Halo-halo is very simple, with only few ingredients of macapuno (sweet strip of macapuno coconut), leche flan, sweet saba (a certain type of banana), and of course the finely-shaved ice, milk, and a dash of dayap. What makes this halo-halo stand out among the rest, is because of the finely-shaved ice which is very easy for us (halo-halo fanatic) to mix up all the ingredients. Halo-halo - (from Tagalog word halò, "mix") is a popular Filipino dessert that is a mixture of shaved ice, evaporated milk, sugar and added with various boiled sweet ingredients like kidney beans, garbanzos, kaong fruit (sugar palm ), langkâ or "jackfruit" (caramelized in sugar), sweet strip of macapuno coconut (caramelized in sugar), ube halaya (purple yam), nata de coco, sweet saba (a cetain type of banana, Cebuano called it "sab-a"), pinipig (pounded crushed young rice) etc. 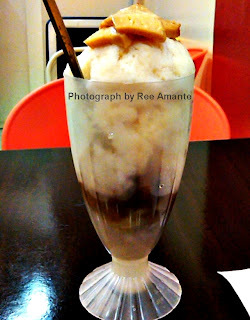 Here's how the preparation, most of the ingredients (fruits, beans, and other sweets) are first placed inside the tall glass, followed by the shaved ice. 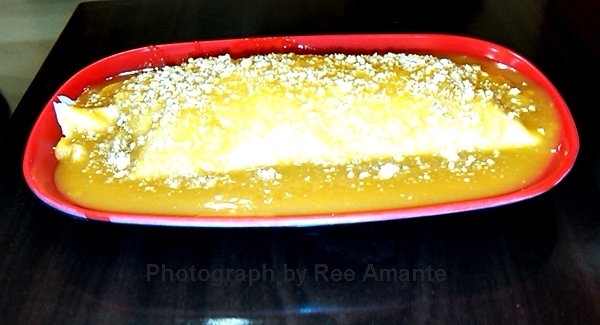 This is then sprinkled with sugar, and topped with either (or a combination of) leche flan, ube halaya, or ice cream, evaporated milk is poured into the mixture upon serving. And you have to mix (halò) it together before eating. 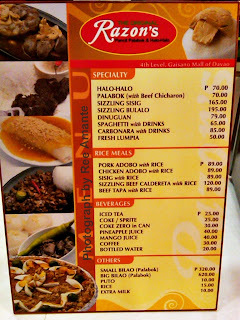 Razon's is originally from Pampanga, Philippines. And move to the National Capital Region (NCR) with a lot of store branches in there. It specialized filipino food such as Halo-Halo, Palabok, Sizzling Sisig, Sizzling Bulalo, Dinuguan,Fresh lumpia, and a lot more. These are some of the prices in their menu. Just click the picture to enlarge. J.P. Laurel Ave., Lanang, Davao City.